The Premier League finishing line is now coming into clear sight. Less than a third of the season remains, with 27 games played and only 11 each to go. No doubt there will be plenty more twists and turns in these final three months of matches but what could be the best way to try and predict how the final Premier League table will look? Currently, West Brom are bottom with 20 points, but only six points then separate Bournemouth in 10th and Stoke in 19th. 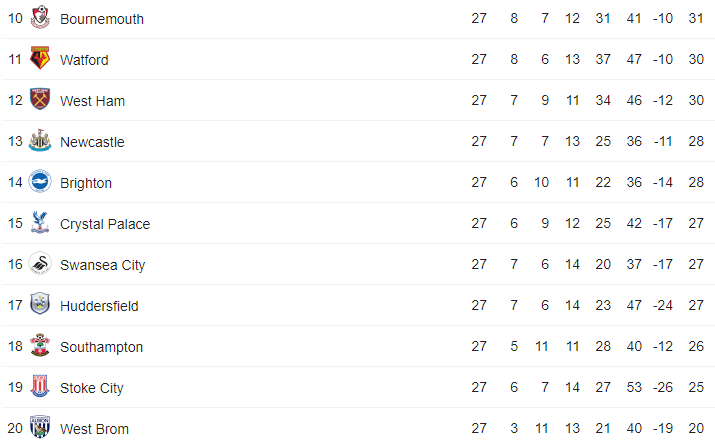 Well, below I have looked at the last 11 results for each of the clubs that still look definitely in the relegation battle. Then I have added the same number of points (from the last possible 33) onto each club’s total, to get a final points total for all 11 Premier League clubs at the bottom. This is on the basis that most recent form is the best guide to what will happen next. As you can see, using this prediction basis would see Newcastle survive comfortably in 14th place with 41 points. Not the greatest of recent form in terms of wins – only against Stoke, West Ham and Man Utd, but on the other hand Rafa has made NUFC hard to beat, the only defeats in the last 11 being against Arsenal and Man City (twice). Very bad news though for Alan Pardew and West Brom, they only have one win in the last 11 and indeed the overall record since Pardew arrived at The Hawthorns in late November is even worse, with 1 win, 5 draws and 7 defeats.